Freeman joins Sean Gallagher and Michael D Higgins on the ballot. 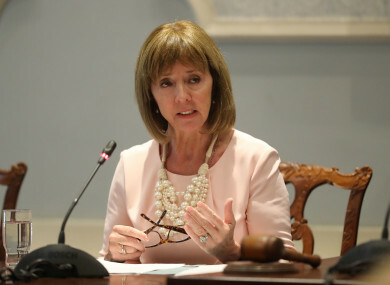 PIETA HOUSE FOUNDER, and senator, Joan Freeman will contest next month’s presidential election, after securing a fourth council nomination to stand. Freeman received the backing of Galway County, Galway City, Cork City and Fingal council to challenge Michael D Higgins for the presidency. Businessman Sean Gallagher also received his fourth nomination from councils today, meaning he will also contest the 26 October election. In a statement on Twitter, Freeman said: “I am honoured to be nominated to run for President. I want to thank the four Councils who nominated me and all the councillors nationwide who supported me. I look forward to campaigning on the ground across the country. I also look forward to debating the other candidates on TV, radio and online. Last Monday, Cork City Council voted for Joan Freeman as its preferred candidate. This was followed today with backing from the two Galway councils and Fingal. Candidates have been addressing local authorities in the past few weeks making their case about why they should receive the council’s backing. The next person closest to securing a nomination is businessman Gavin Duffy, who has secured the backing of two councils. A number of councils have yet to vote on their nomination to contest the presidential election. Email “Pieta House founder Joan Freeman becomes third official candidate in presidential race”. Feedback on “Pieta House founder Joan Freeman becomes third official candidate in presidential race”.